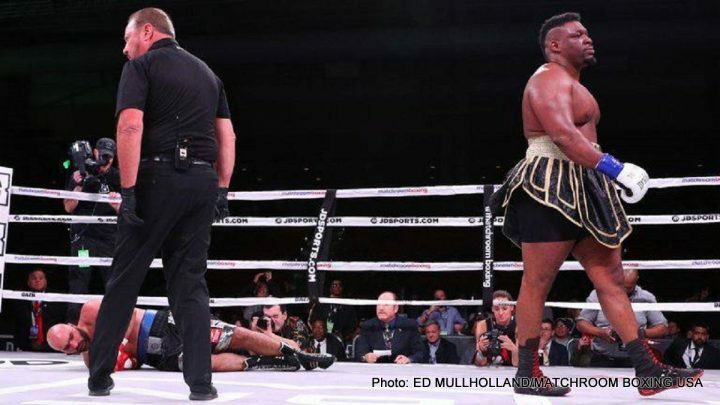 By Tim Royner: Jarrell ‘Big Baby’ Miller is still in the running for Anthony Joshua’s next fight in April or June of this year. Miller’s only competition for the Joshua fight is Dillian Whyte (25-1, 18 KOs), who is still negotiating to try and get a better deal from Matchroom Boxing to face AJ. Miller, 30, thinks that Whyte is the one that Joshua wants for the fight for his April 13 fight, but he sees it as a 50-50 situation. Miller hopes to find out by Thursday or Friday of this week whether he’ll be getting the fight with Joshua. If Whyte prices himself out, then Miller will be the next guy up, and he doesn’t intend on asking for too much and losing out on the fight. Miller, 6’4″, wants the opportunity to fight Joshua (22-0, 21 KOs) so that he can beat him, and take over as the top guy in the division. Miller feels that Joshua can be beaten by at least three of the top heavyweights in the division, and he’s one of them. Matchroom and Joshua aren’t working overtime trying to get the rematch with Whyte, 30, out of kindness for him. They obviously know it’s the biggest money fight out there for them, aside from Deontay Wilder and Tyson Fury, who aren’t available right now to fight AJ due to them heading for a rematch. Since the American Miller isn’t a household name in the UK like Whyte, it makes for Hearn and Joshua to try as hard as they can to make that fight. Whyte knows they want him, so he’s asking for as much as possible before he agrees to sign. Whyte might even be looking to get the same kind of deal that Hearn offered to Wilder and Fury. Those two were offered a 60/40 split to face Joshua on April 13, and neither of them showed interest. They want a 50-50 deal. The winner of the Wilder-Fury 2 fight might end up getting the 50/50 deal from Hearn for a Joshua fight. If Fury beats Wilder in the second fight, there’s a good chance he gets a 50-50 deal, because he’s a big name in the UK. If Wilder emerges as the winner, Hearn will likely bump up his 60-40 offer to 55-45, and then stay at that percentage. If Wilder is stubborn about it, there won’t be a fight, because Hearn and Joshua probably won’t want to give Wilder the 50 percent deal that he’s asking for. They can wait until someone eventually beats Wilder, and then go after that fighter to try and win the World Boxing Council title. “I think it’s still 50-50, because like I said before, Dillian Whyte is still in the driving seat,” Whyte said about his chances to get a fight against Joshua. The World Boxing Association has ordered Miller to face #1 WBA Trevor Bryan, but it’s unclear if he’s going to bother to do that. Miller is in a position where he doesn’t need to earn the fight against Joshua anymore by taking risky fights. The fight is going to be there for Miller no matter who he faces. If the fight with Joshua does happen for Miller, it’ll be in New York in June or September. Miller may have to wait for Joshua to face Whyte first in April, but he has a good chance of getting the fight after that if the Wilder-Fury winner doesn’t accept Hearn’s offers to face AJ in a unification fight.